Over the years that Joseph P. Riley Jr. has worked to secure funding for the International African American Museum (IAAM), the former mayor of Charleston has maintained that the effort was less a sprint and more a marathon. Now, following the announcement of a $10 million donation to the project, the museum has taken a major leap forward to becoming a reality. 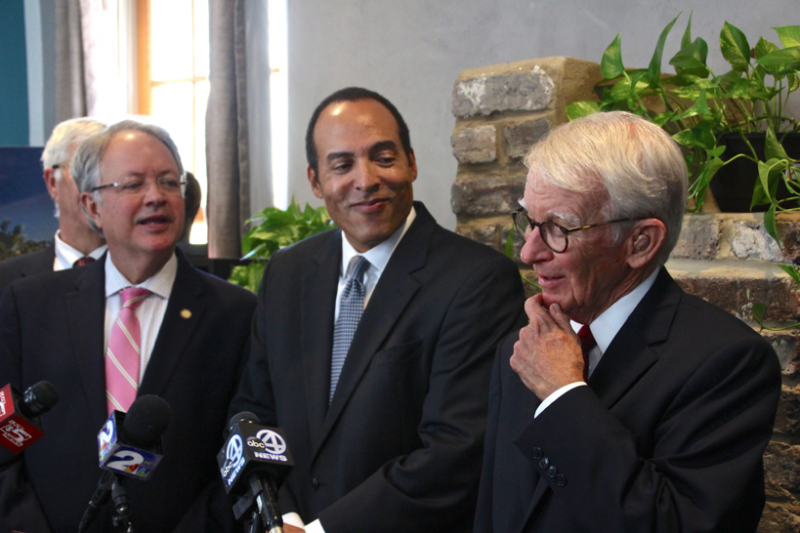 On Tuesday, IAAM CEO and President Michael Moore was joined by Riley and Charleston Mayor John Tecklenburg to announce a $10 million investment from the Lilly Endowment. The Indianapolis-based private philanthropic organization’s donation will be distributed among four major initiatives within the museum. Half of the money will go toward the design and construction of the $75 million museum, while $4 million will be used to create an endowment, which will be used to fund ongoing activities with scholars, consultants, and religious leaders to support programming related to spirituality. The remaining $1 million will be split evenly to fund the museum’s inaugural changing exhibit on religion and music and pay for efforts to engage the faith-based community. “The [Lilly] Endowment’s multipronged investment will not only play a crucial role in bringing this institution to life, but it will help ensure the International African American Museum’s ability to accurately illustrate the central role of faith in African-American history and culture,” said Moore. The museum’s relationship with the Lilly Endowment began more than two years ago, when Riley placed a call to Indianapolis’ mayor at the time, Greg Ballard. With Ballard providing an introduction, Riley then began talks with the organization, which culminated with an invitation to apply for the $10 million in funding. According to Riley, the museum’s 122-page proposal was sent out 30 minutes before the deadline. “This incredibly generous gift and most significant investment from one of America’s most respected organizations is such a powerful endorsement for this museum. For it, from the heartland of America, says what you are working on and plan to build is important to our entire nation,” said Riley. Moore said Tuesday that the museum is on track to open during the first quarter of 2020, but added that donations both large and small will allow the museum to reach its goal. The museum is gearing up to launch its inaugural charter membership program that will allow donors to join for as little as $25. With $5 million of Lilly’s donation going toward construction, less than $9 million separates the museum from its private fundraising goal of $25 million. Over previous years, state legislators have allocated another $14 million to the museum’s construction, but lawmakers in the state House of Representatives decided to pull funding from the most recent budget until all private funding is secured. The remaining third of the museum’s $75 million price tag will come from Charleston County and the city of Charleston. “This museum has been a long time coming, but this museum’s time has come,” said Mayor Tecklenburg.